Golden lion tamarins are among the rarest animals in the world, according to the World Wildlife Fund. It is listed as endangered according to the International Union for Conservation of Nature. 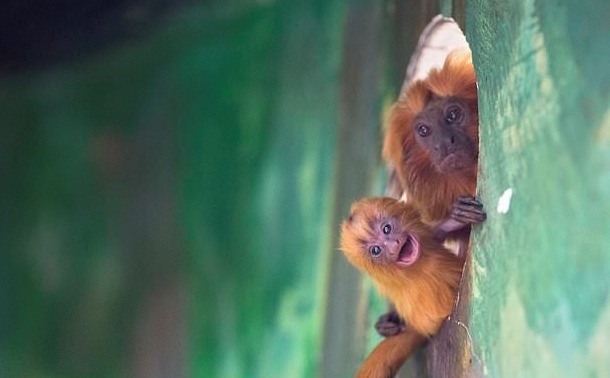 An Israeli wildlife park says an endangered primate known as a golden lion tamarin has been born in captivity. The Jerusalem Biblical wildlife park says the monkey was born two weeks ago to mom Bilbi and dad Zohar. The yet unnamed monkey was seen Thursday clinging to its mother's back. The Jerusalem wildlife park says the primate was under threat of extinction in the 1980s when less than 100 were found in its native Brazil. But a breeding program in zoos around the world halted its decline. Today, there are hundreds of golden lion tamarins in the wild and in zoos worldwide. 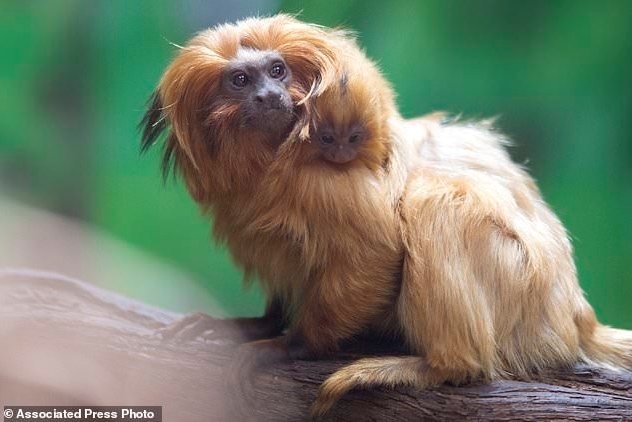 The golden lion tamarin gets its name from its bright reddish orange pelage and the extra long hairs around the face and ears which give it a distinctive mane. Its face is dark and hairless. It is believed that the tamarin gets its hair color from sunlight and carotenoids in its food. The golden lion tamarin is the largest of the callitrichines. It is typically around 261 mm (10.3 in) and weighs around 620 g (1.37 lb). There is almost no size difference between males and females. As with all New World monkeys, the golden lion tamarin has tegulae, which are claw-like nails, instead of ungulae or flat nails found in all other primates, including humans. Tegulae enable tamarins to cling to the sides of tree trunks. It may also move quadrupedally along the small branches, whether through walking, running, leaping or bounding. This gives it a locomotion more similar to squirrels than primates. Responses to "Rare, endangered primate is born in Jerusalem"